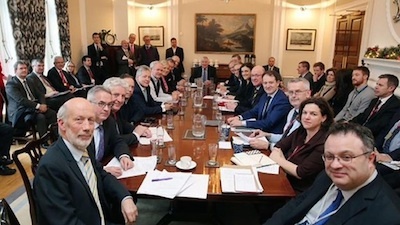 The grandly titled Stormont House Agreement (it conjures up images of the Irish foreign minister politely proffering a plate of Ferrero Rocher) looks not so much like an agreement, more a series of stop-gap and unrelated ideas to rekindle the dying embers of interest among a wearied electorate. The spectacle of well-paid politicians tweeting self-congratulatory photographs of themselves to a people struggling through economic recession did little to dispel the view that the parties saw it all as a Christmas football match among the trenches of prolonged sectarian warfare. Or maybe they just reached agreement to prevent the Queen’s Christmas Day references to the north from sounding silly. While the agreed paper contains little which could not have been achieved within the daily workings of a normal government, its financial details represent a massive shift to the right in Stormont’s ideology. If this document does not exactly reflect the hand of history, it certainly smacks of the hand of Margaret Thatcher. It was achieved by the British government moving from bribing Stormont with its own money, to bribing it with its own debt. The new financial arrangements are based on David Cameron’s ideology that all Britain’s ills (“a bloated, high-tax, welfare-heavy nation”) stem from the public sector. Sinn Fein previously said that he was “a penny pinching accountant”. He is, but the party is either ignoring or misunderstanding his approach to public sector finances. It is a bit like criticising the spots on a child’s face, rather than explaining measles. Conservative Party (and Fine Gael) ideology of transferring much of the state’s apparatus to the private sector. They have a perfectly valid right to do so. However, having apparently opposed at least parts of it in recent months, Sinn Fein and the SDLP have now agreed to implement this policy by borrowing money to lay off thousands of public sector workers (including teachers) and to sell off as many public properties and other assets as they can. They have also abandoned their much-publicised opposition to welfare reform. They have agreed to pay the fines for failing to implement the new welfare system up to now (explain that to redundant teachers). They will continue to fund any future deviation from those rules by diverting money from other sources without any additional cash from Westminster. So, while the parties can claim to have protected some of the original welfare system, Cameron won the bigger argument by forcing them to adopt his experimental model of society based on individualism rather than collective social responsibility. No-one tweeted that bit. The agreement deals with the past by burying it with bureaucracy. It proposes four separate bodies, which display little obvious connection. They include an oral history project, which will incorporate research to produce ‘a factual historical timeline’ of the Troubles (Oh good, we are about to get an ‘official’ history). The PSNI’s Historical Enquiries Team (HET) will be replaced by the PSNI’s Historical Investigations Unit (HIU). (You can make your own comment on that one.) A Commission on Information Retrieval will privately collate information about individual deaths for surviving relatives, but will not pass the information to the legal authorities, thereby rendering the past officially dead. A fourth organisation, the Implementation and Reconciliation Group, will formally bury the past by, among other things, ‘reducing sectarianism’ (but presumably not in Stormont). On the downside, Irish is only for Catholics because, in agreeing to the Commission on Flags, Identity, Culture and Tradition, nationalists have now formally stated for the first time that Protestants do not have an identity, they have their own culture. The concept of the Irish nation is finally dead. It is hard to see how the agreement represents anything other than a further political consolidation of Britain’s victory in the long war. However, the parties will prescribe it as a general political anaesthetic, because it allows them to retain power, employ their relatives, pay their friends, claim questionable expenses and pat themselves on the back for keeping their jobs, while thousands lose theirs. The agreement’s most significant aspect is that Stormont has now officially embraced Thatcherism. It will be interesting to read the factual historical timeline on how that came about.